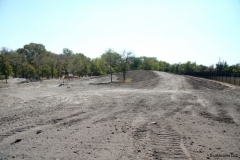 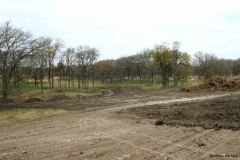 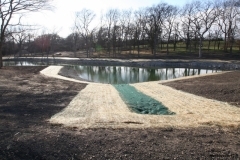 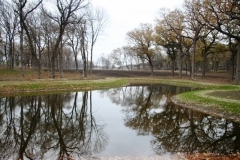 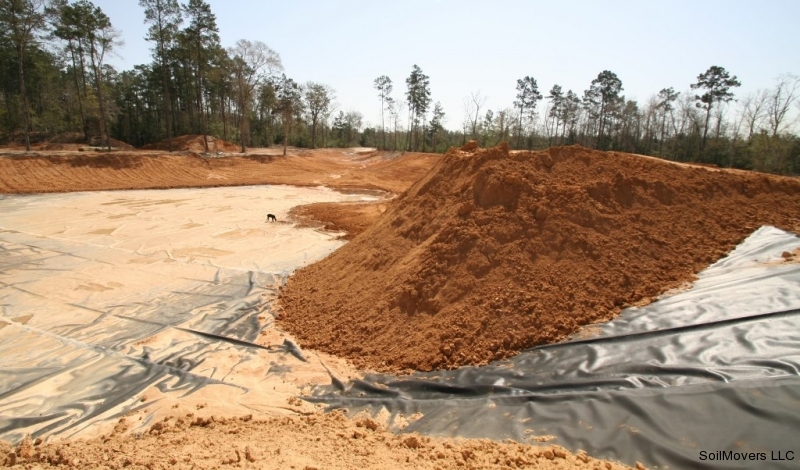 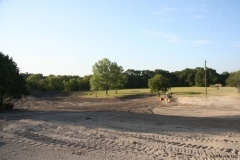 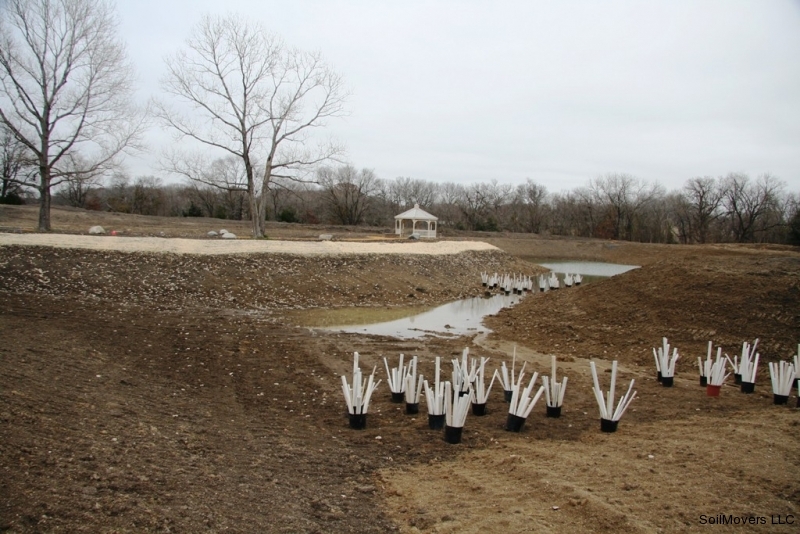 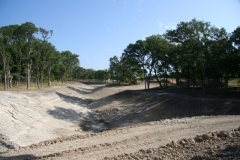 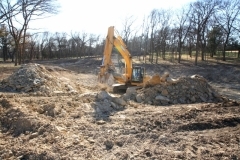 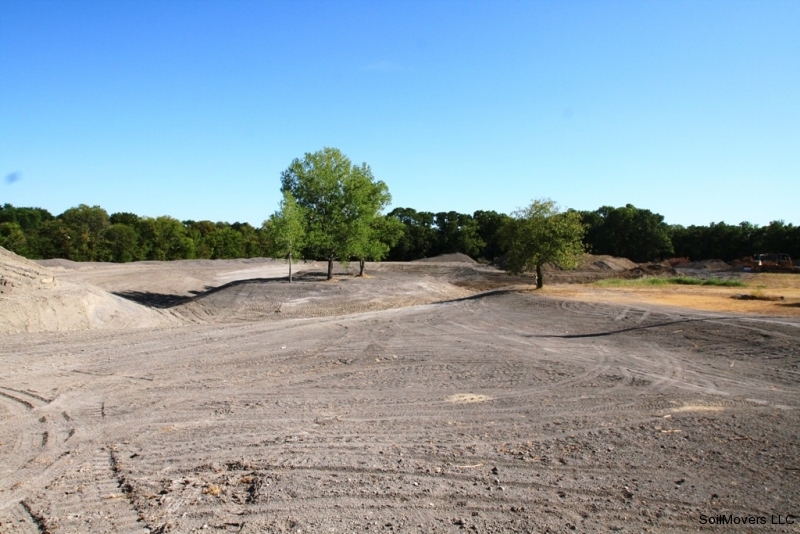 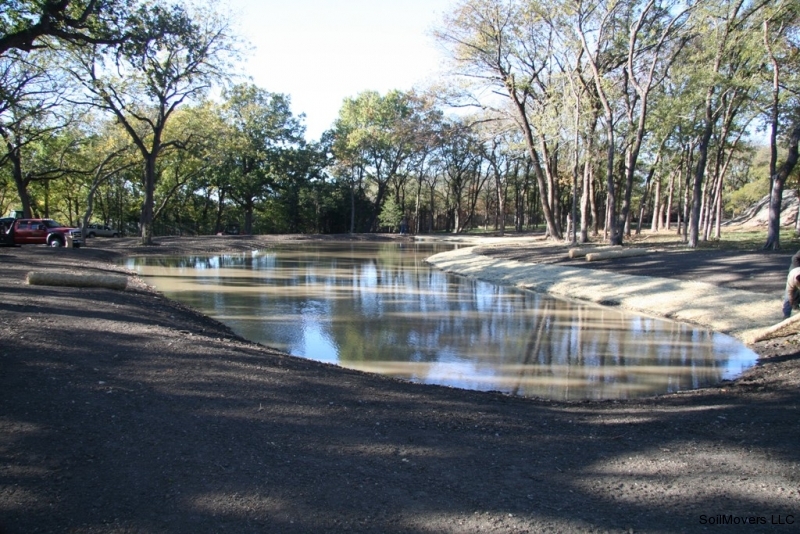 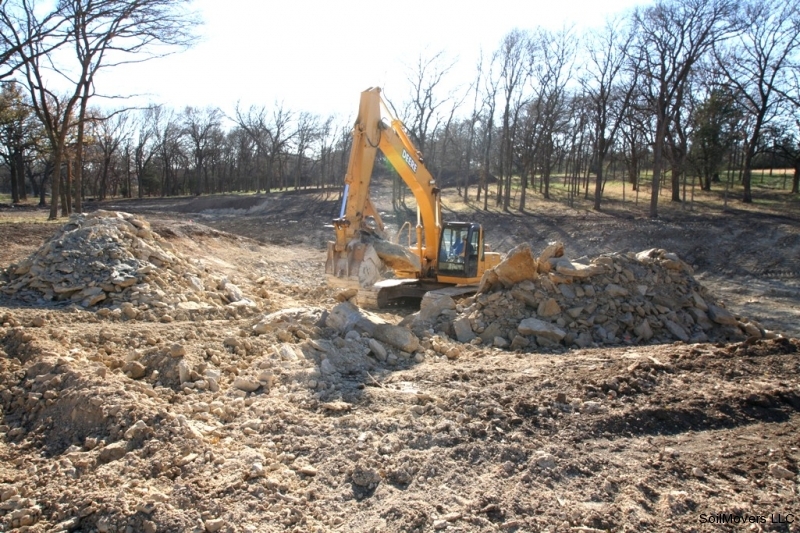 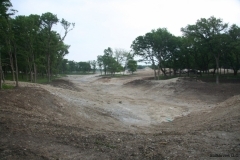 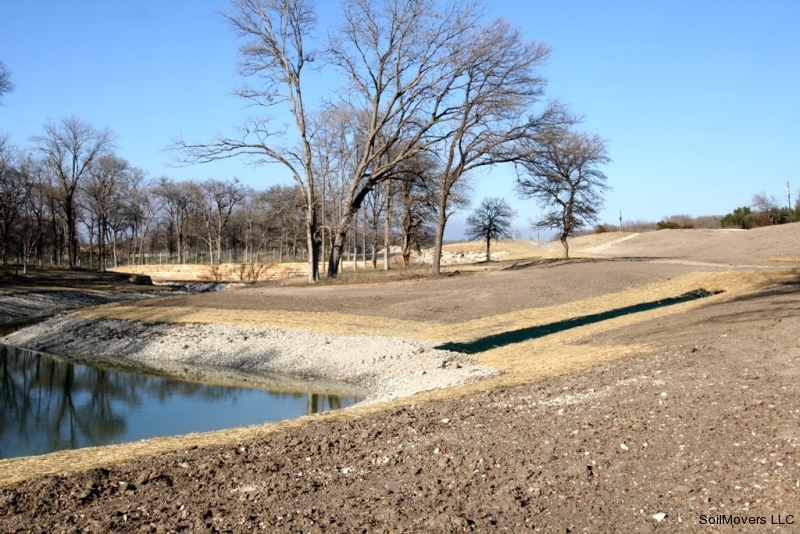 A project in North Texas that will include 3 lakes with plastic liners, roads and multiple house sites on a 30 acre property. 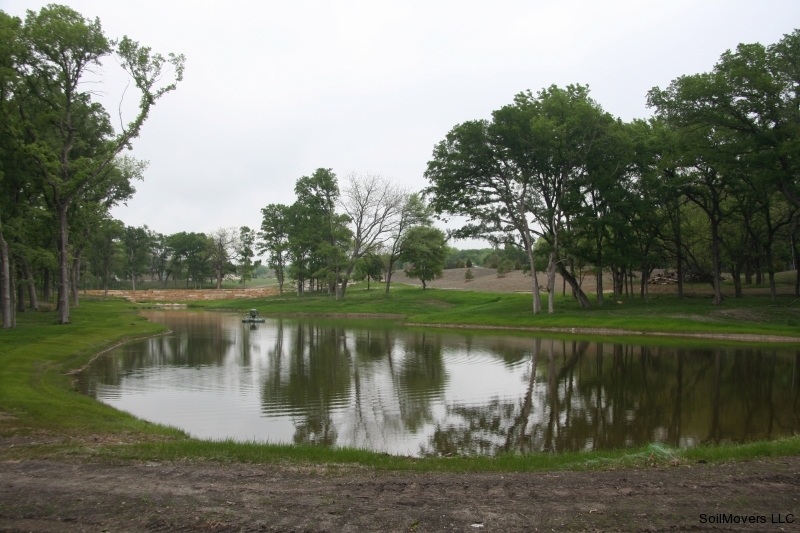 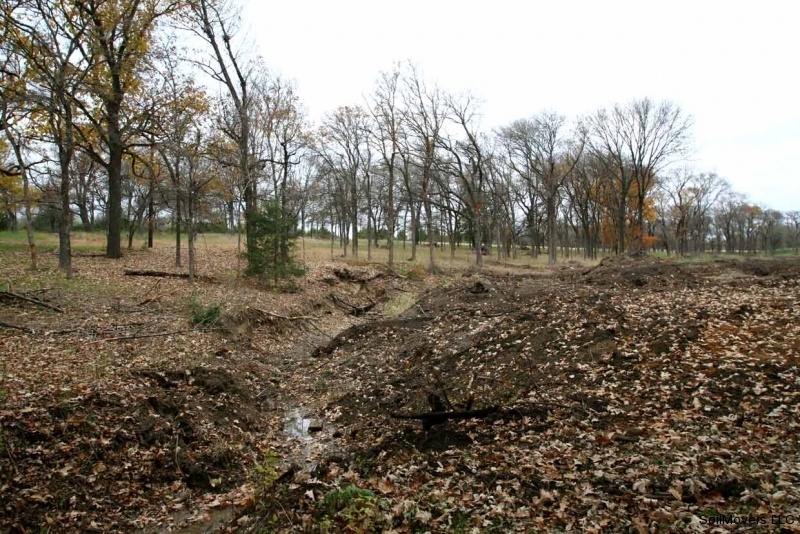 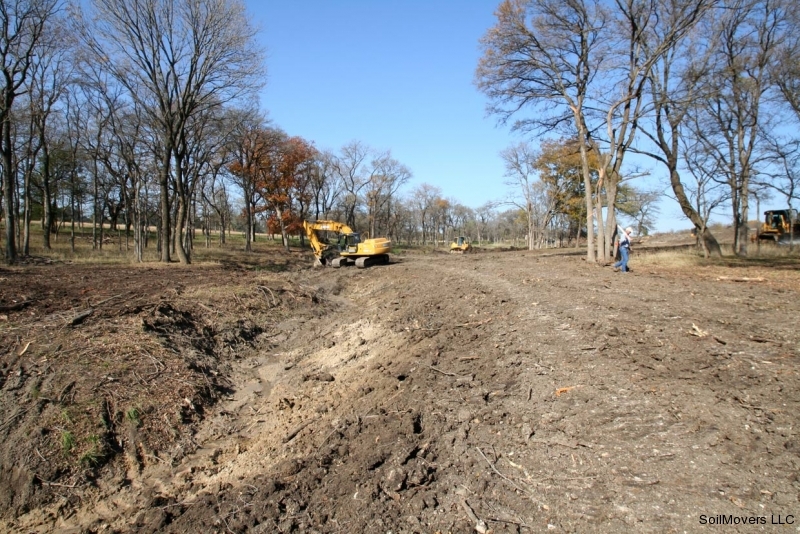 This project requires a high skill level and finesse to properly construct three recreational fishing lakes and sites for multiple homes on a rather small acreage which is more suburban than we are accustomed to. Getting the different aspects of the project to blend together and look natural is the most difficult part. Every lake building project is different and most lake construction projects are very dynamic and change as the work progresses. 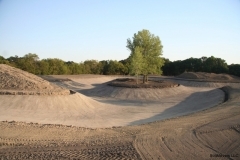 This lake project in North Texas changed more than most. 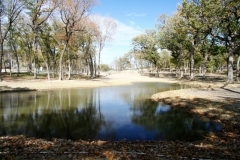 The owner bought adjoining property and added a third lake. 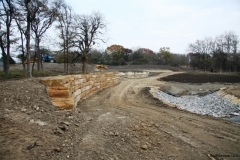 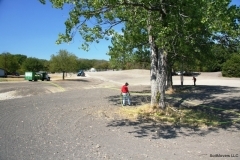 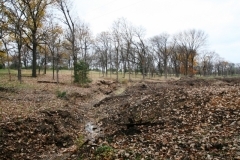 The land owner also decided to add to the surrounding lake infrastructure with a series of rock walls, rock waterfalls and other features which join the three lakes.The soil at this location was very rocky and not suitable for building quality fishing lakes. 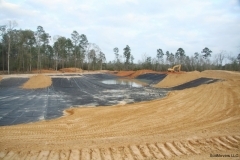 Soil testing before the start of lake construction revealed this and it was decided to use a very heavy 60 mil lake liner to insure water retention in the series of 3 lakes. 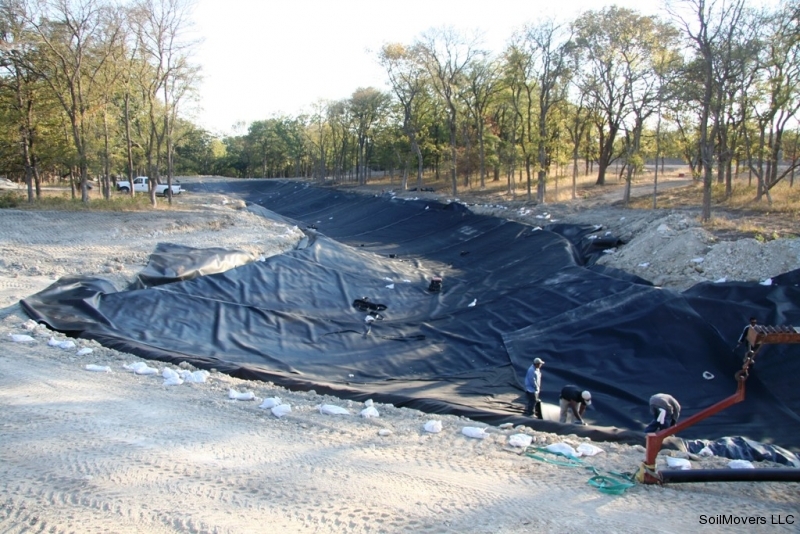 Due to the rocky nature of the soil, a geo textile fabric liner was installed first to protect the plastic lake liner from punctures. 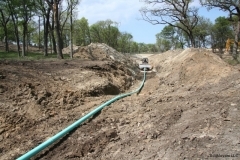 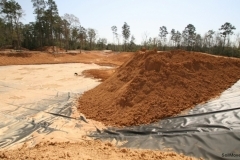 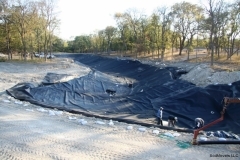 An important factor to note is the plastic lake liner requirement and the nature of the rocky soil were discovered during the initial soil testing phase and it was a known factor prior to the start of actual lake building. 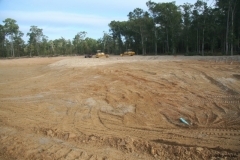 This was a very complicated and ambitious project and the land owner was well pleased with his family compound at completion. 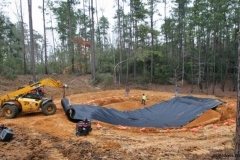 Experience counts and nothing can be left to chance when you are dealing with a challenging lake building project. 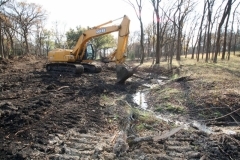 Initial clearing along a wet weather creek. 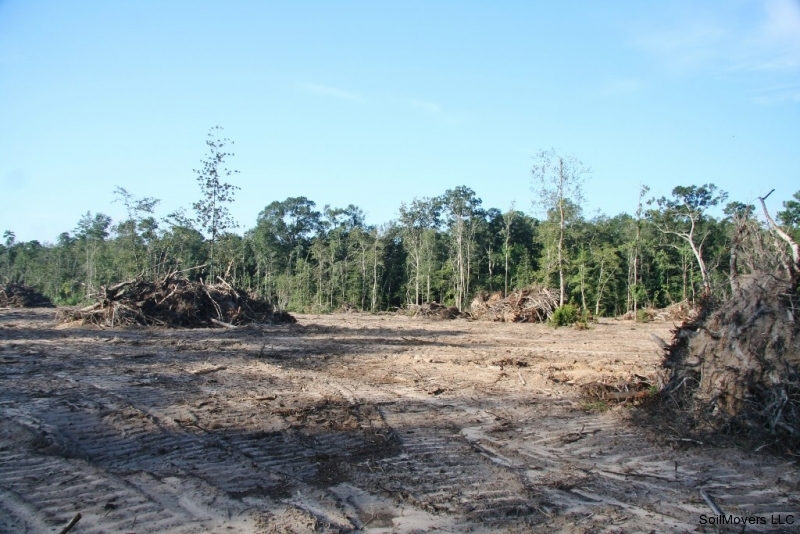 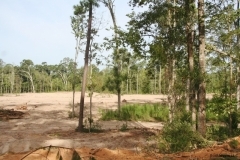 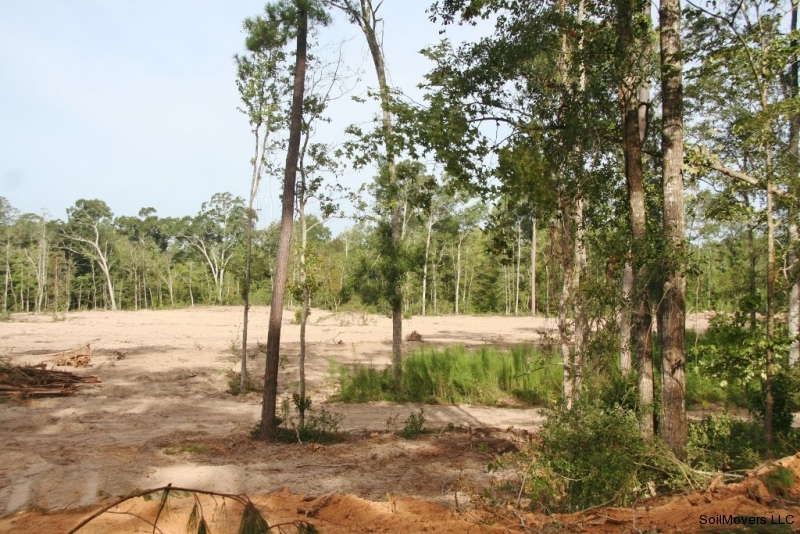 This land was cleared years ago and the owner wishes to keep as many trees as possible so the clearing process was very careful and minimally invasive. 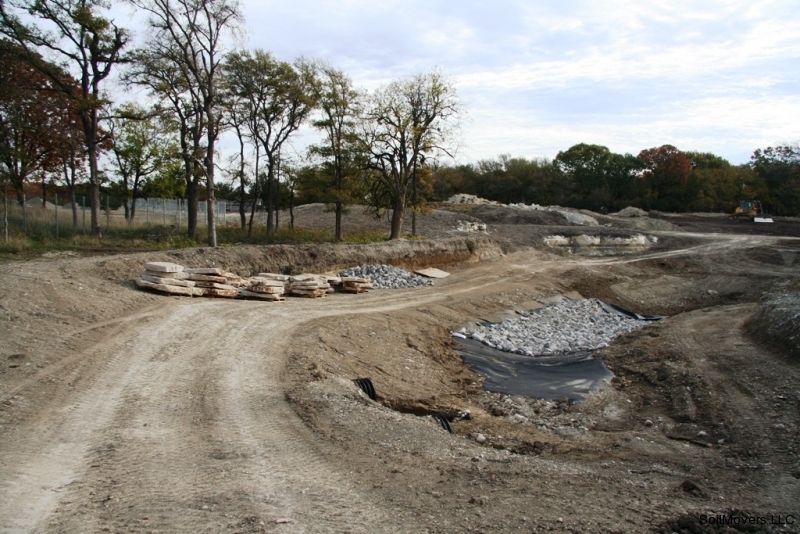 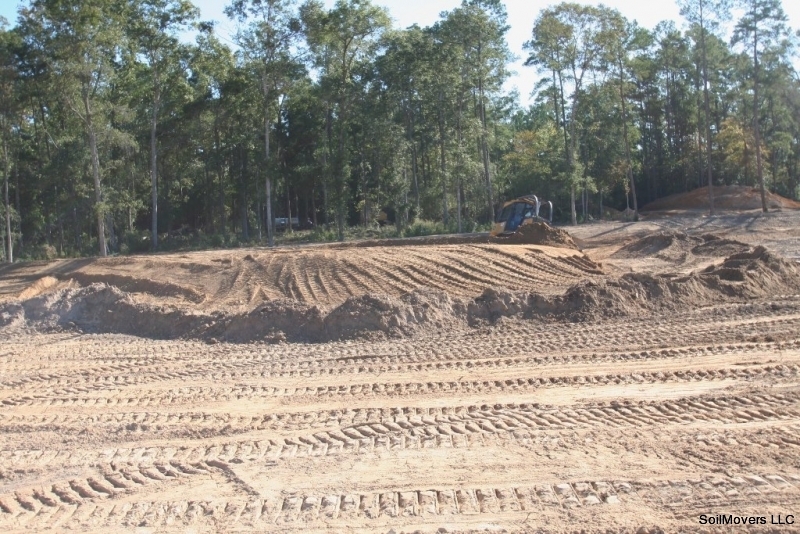 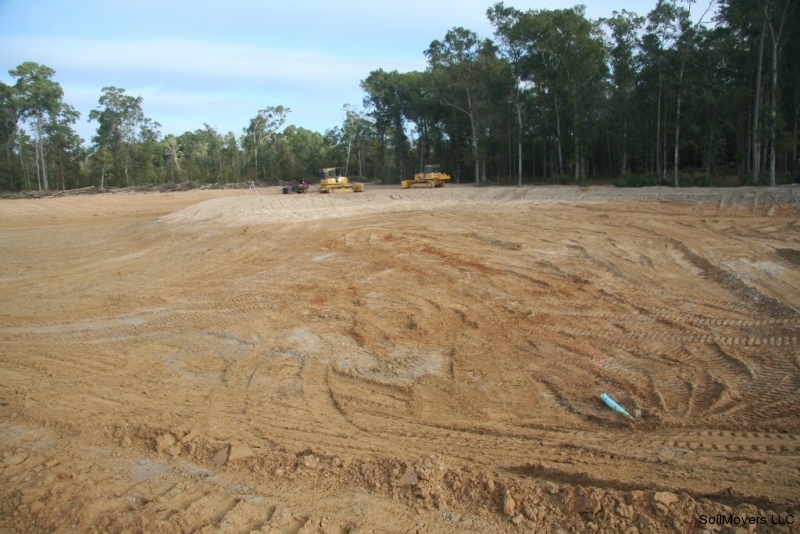 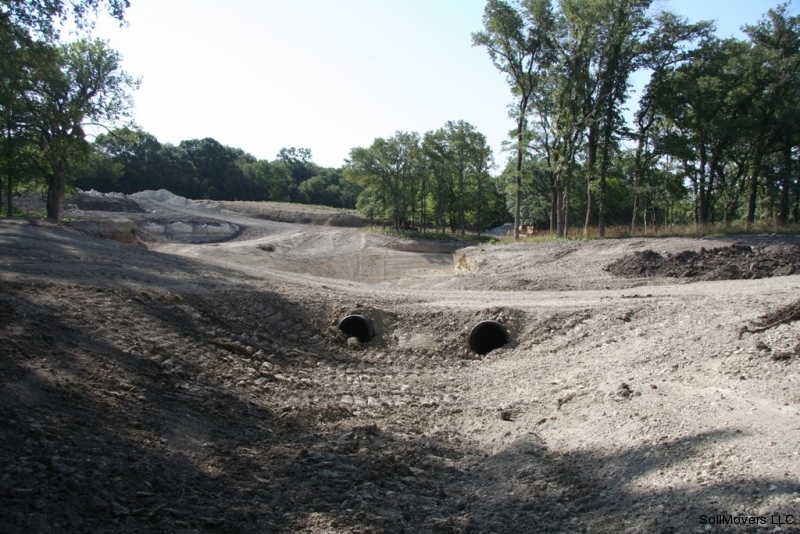 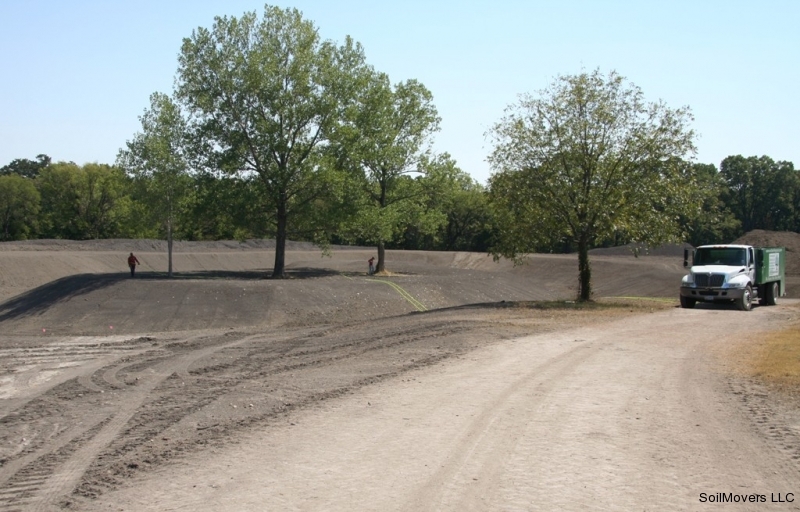 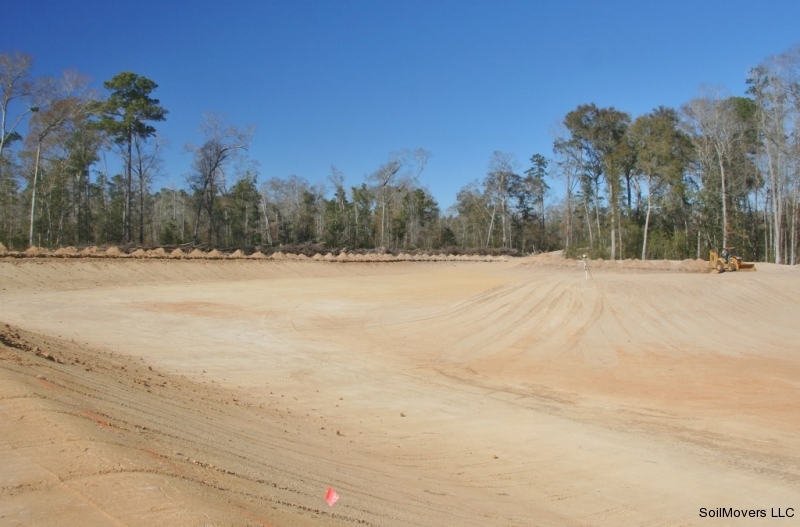 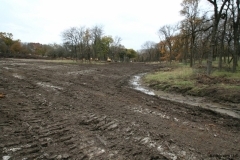 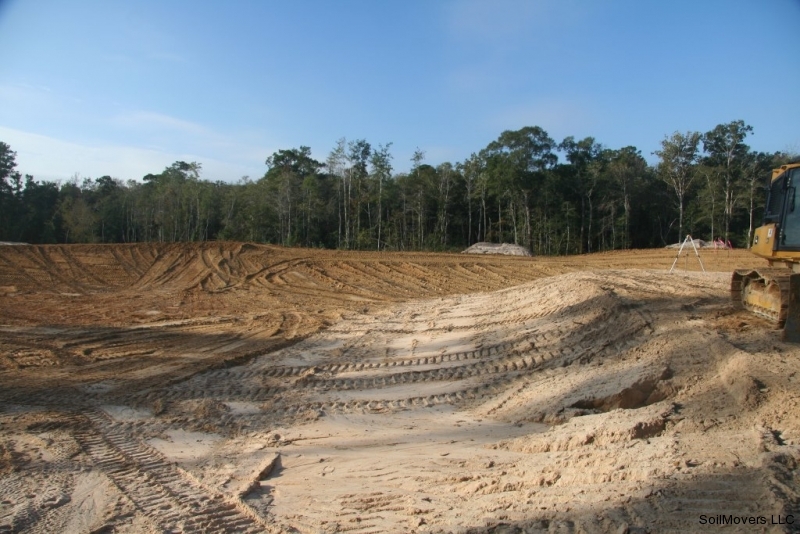 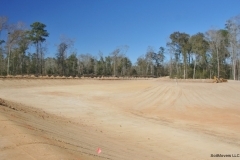 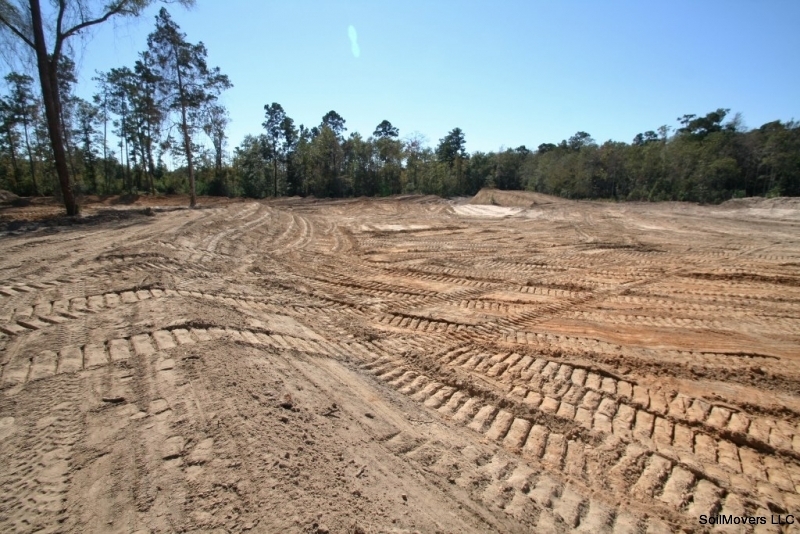 Top soil is removed from the lake site and stored for use during the final phase. 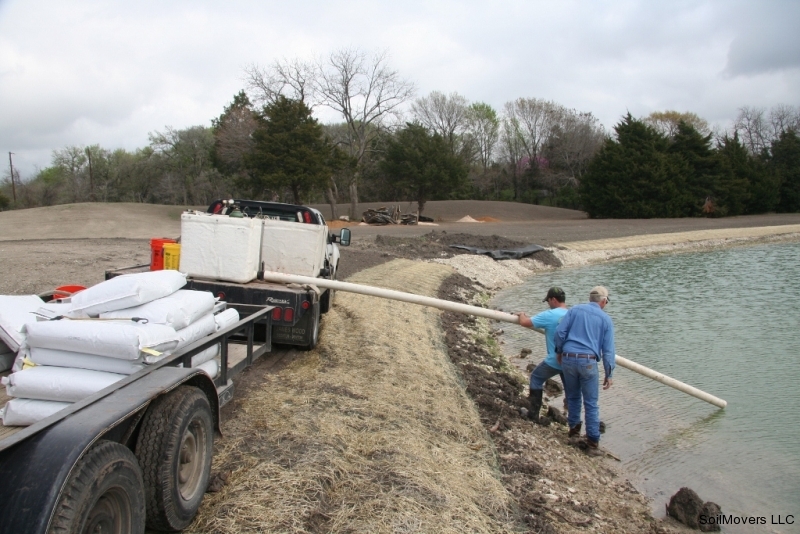 This step is often overlooked by other contractors and the results would be difficulty in EVER establishing good grass cover around the lake. 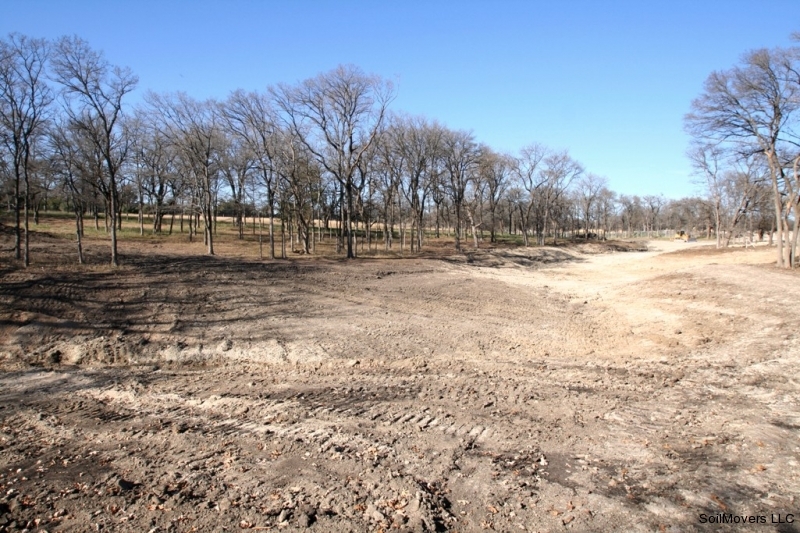 Looking down the long axis of Lake 1 that will eventually incorporate a plastic lake liner. The John Deere excavator is better suited for excavation in wet conditions. 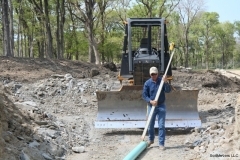 You must have the right equipment for the job or it will end up being costly for the client. 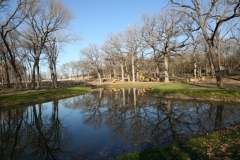 Excavator adds depth to the lake. 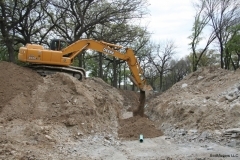 Rocky soil makes excavation difficult. 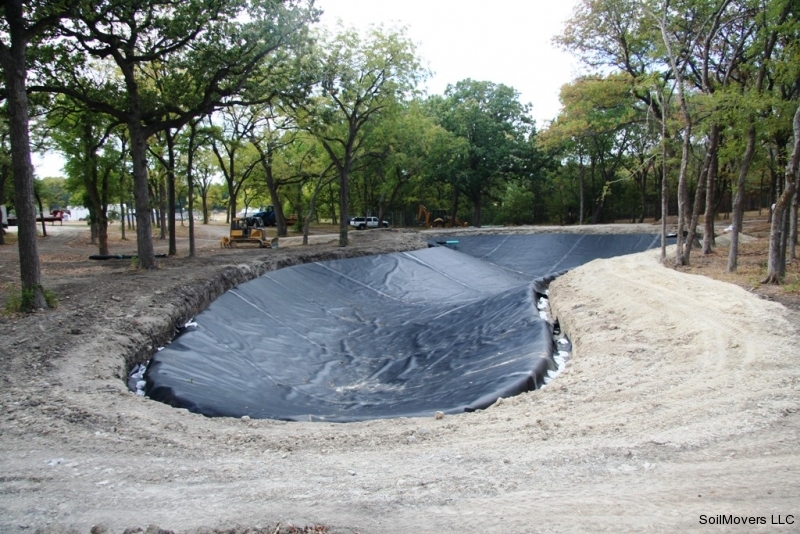 This lake would never hold water without a plastic liner. 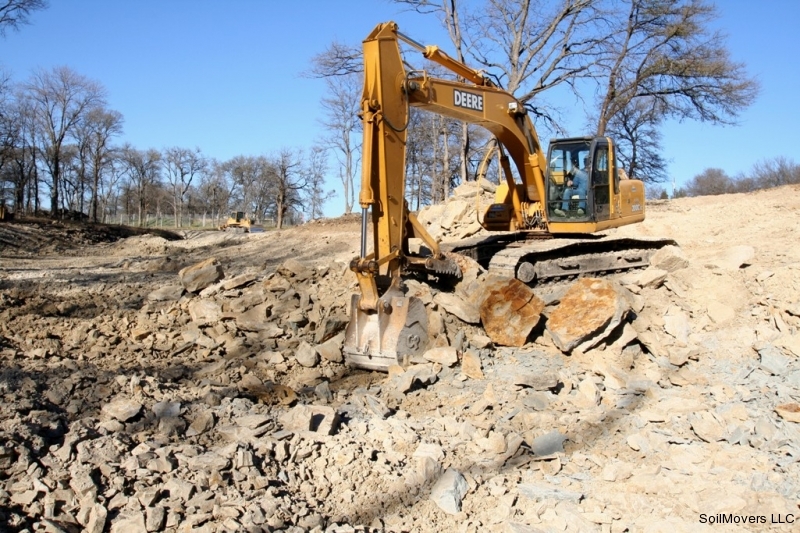 Excavating rock to make lake deeper. 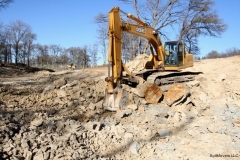 Excavated rock piled by the excavator is later pushed away by a bulldozer. 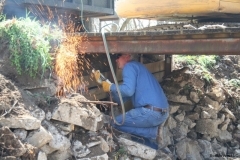 Removing old bridge with a cutting torch. 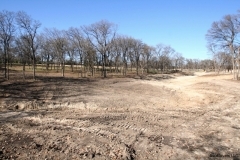 This area will be cleared for the new main lake. 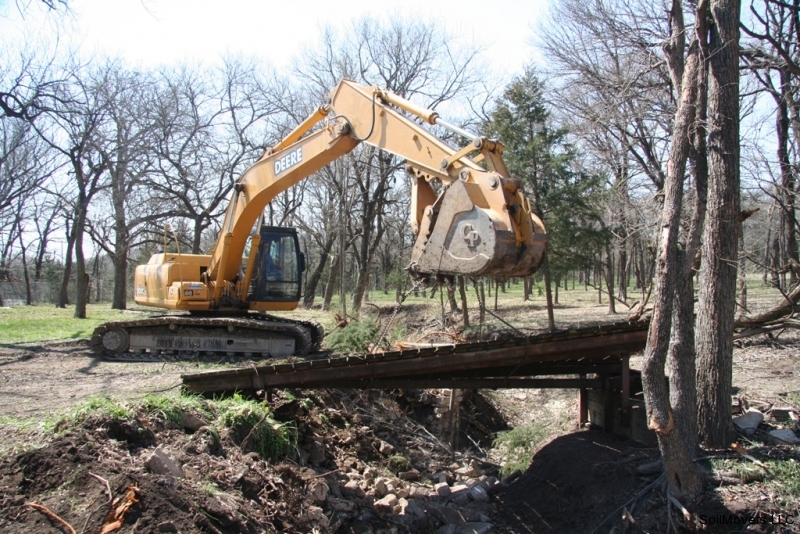 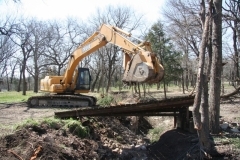 An old bridge had to be removed. 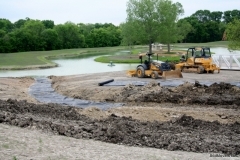 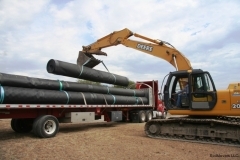 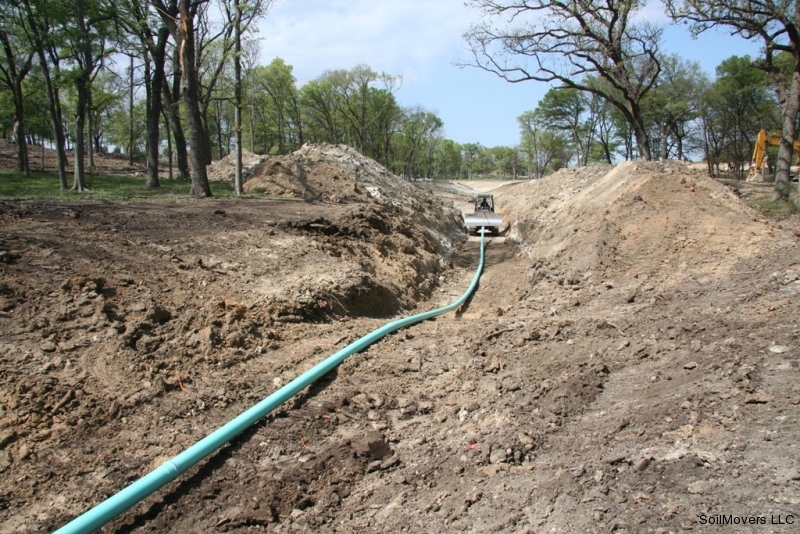 Drain pipe for upper lake allowed work to continue during wet weather. 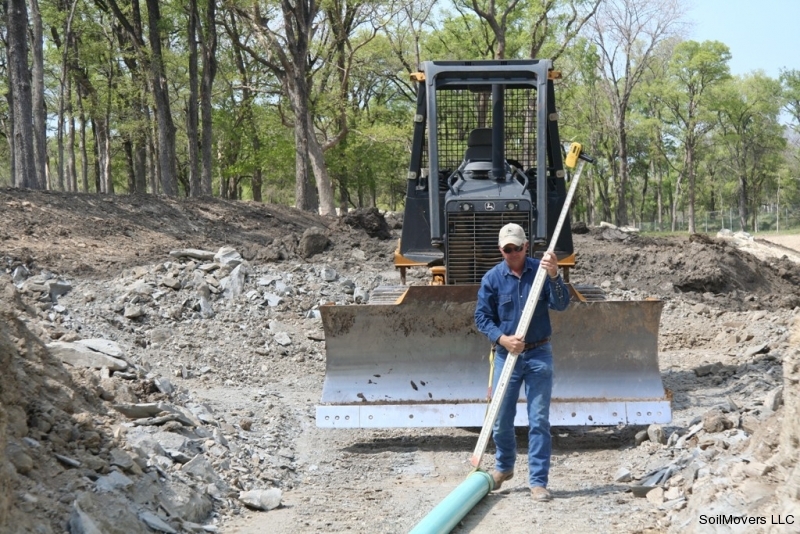 Setting the elevation on the drain pipe. 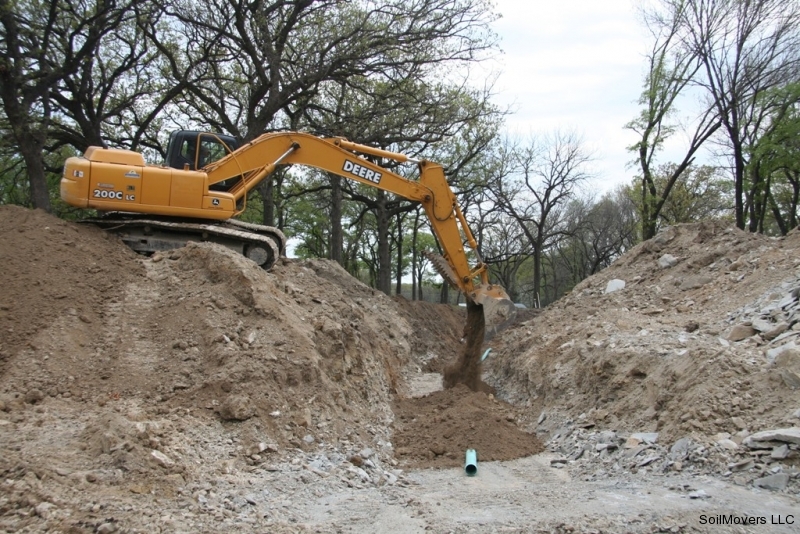 Covering the drain pipe with the proper soil. 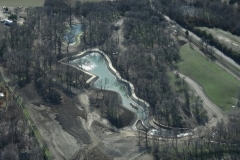 The final shape of Lake 1 begins to emerge. 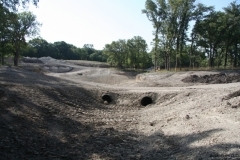 Once the shape is determined, the lake s excavated for proper depth. 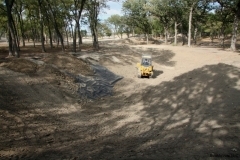 Culverts are added for vehicle access and proper drainage. Access roads begin to take shape. 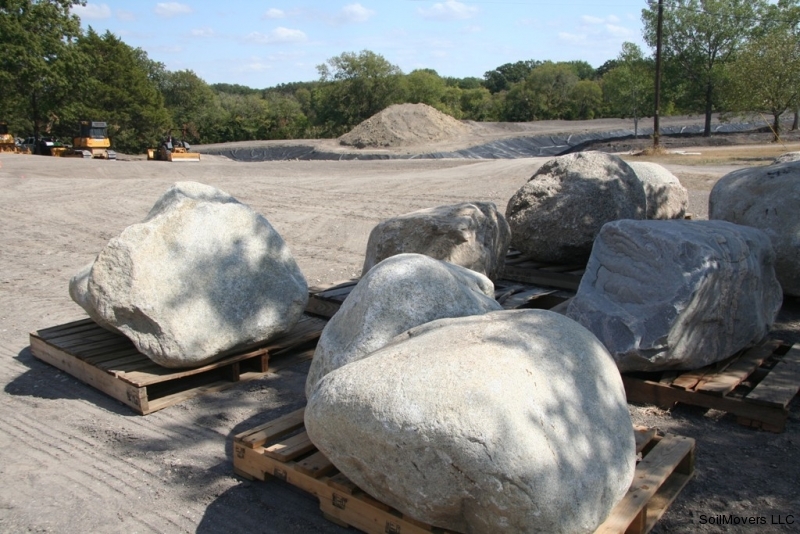 They will be rocked after completion of lake construction. 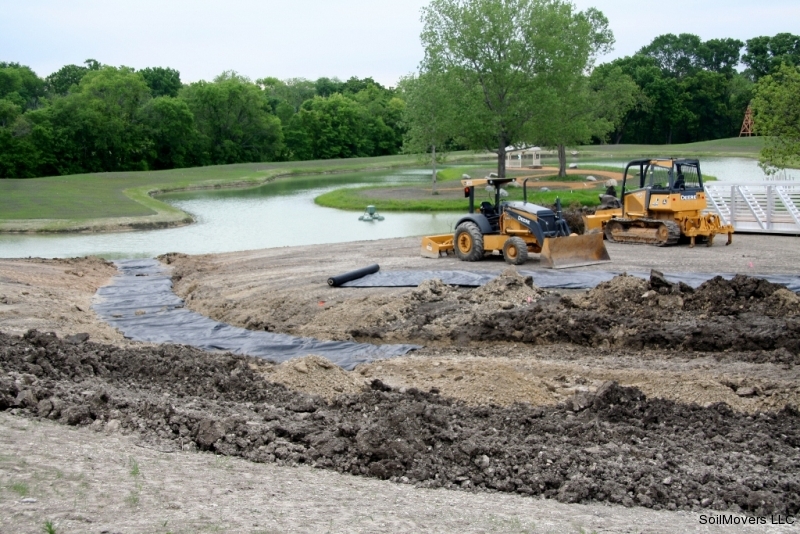 Any lake design is a very dynamic process. 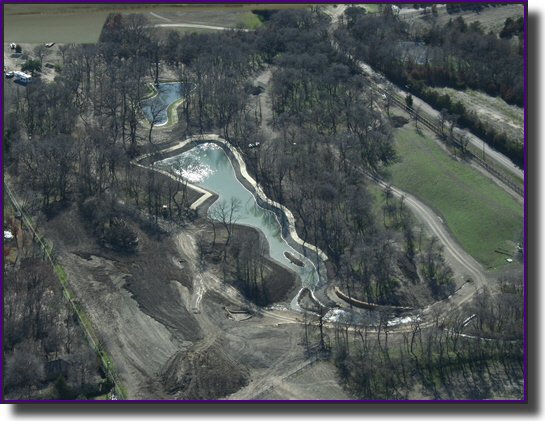 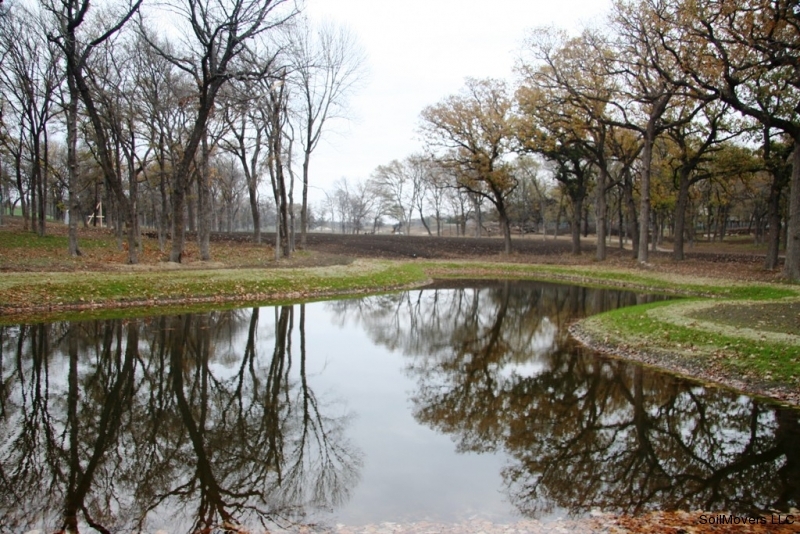 An island with trees is incorporated into the design and becomes a focal point for the lake construction. 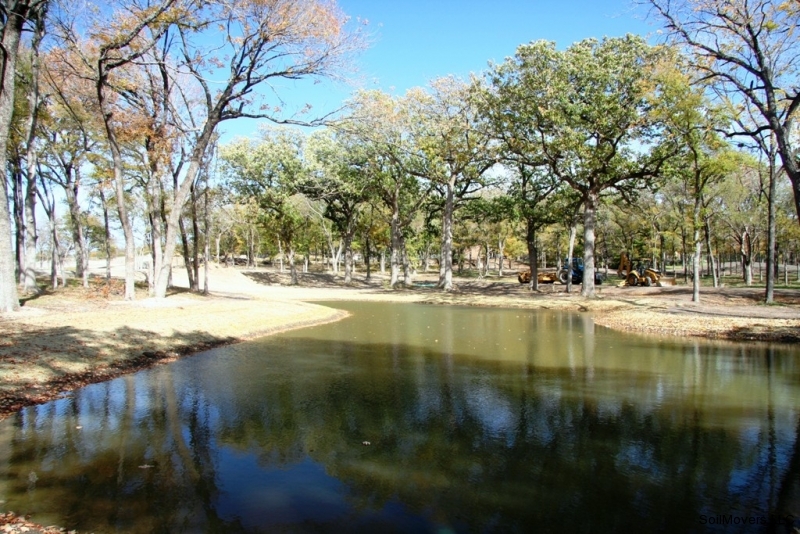 Special attention is given to aesthetics and overall design. 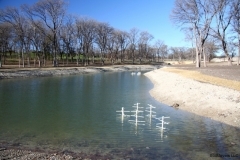 A bridge will cross to the island. The lakes will feed water from the upper lake to the lower lakes. 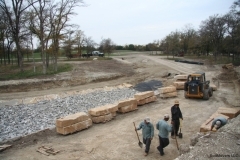 Spillways and retaining walls will be constructed from rock. 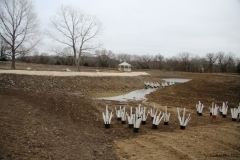 Trees are fed to offset construction stresses. 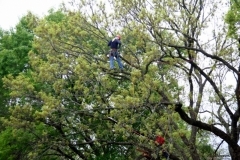 Every effort is taken to ensure the health of trees and the environment. 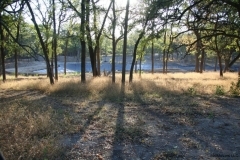 Every attempt is made to blend natural surroundings with the new construction. A firepit will be added at the water's edge. 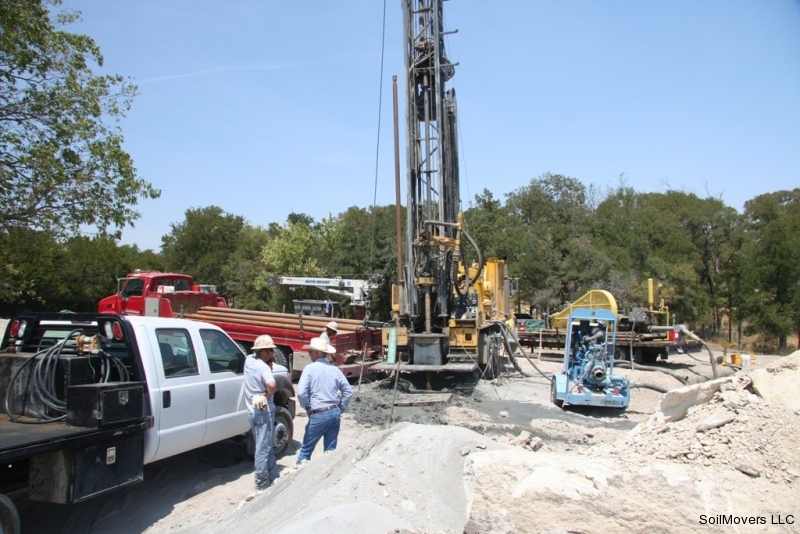 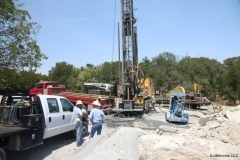 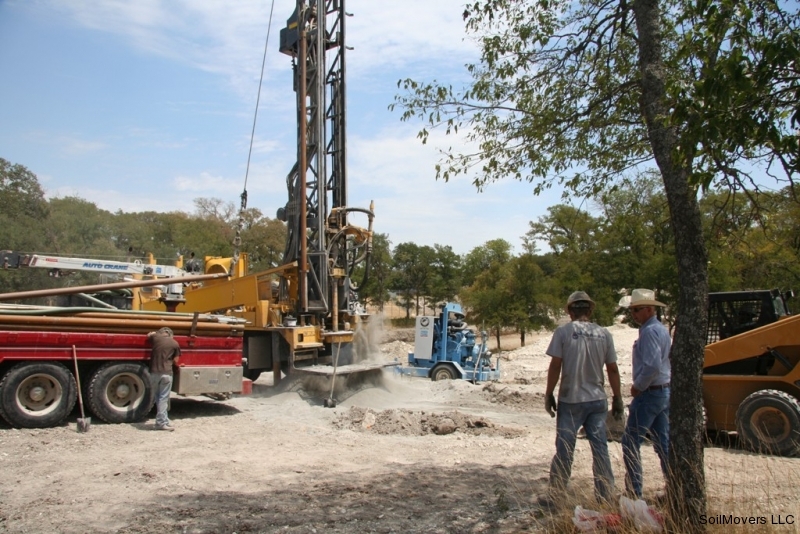 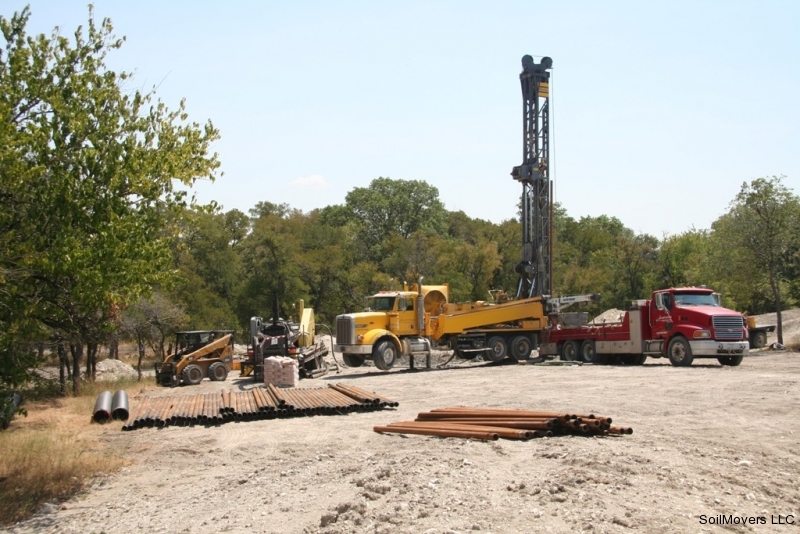 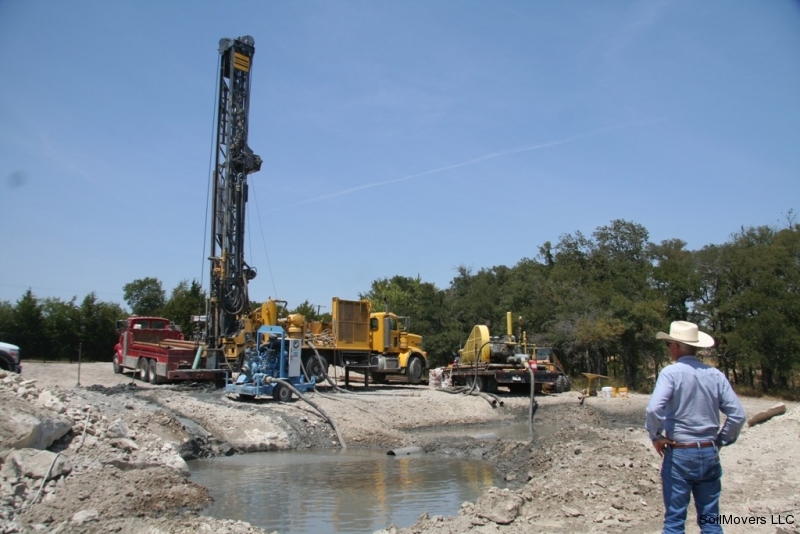 A 1480' water well being drilled. 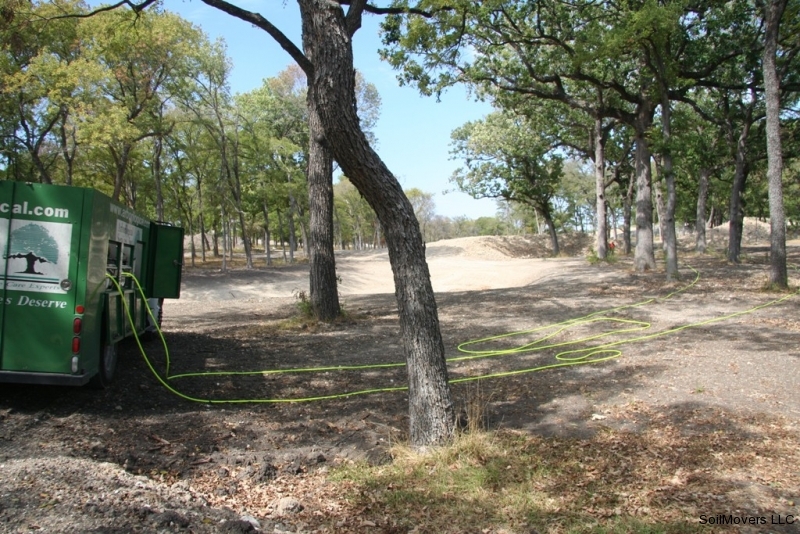 Flow rate is 40gpm. 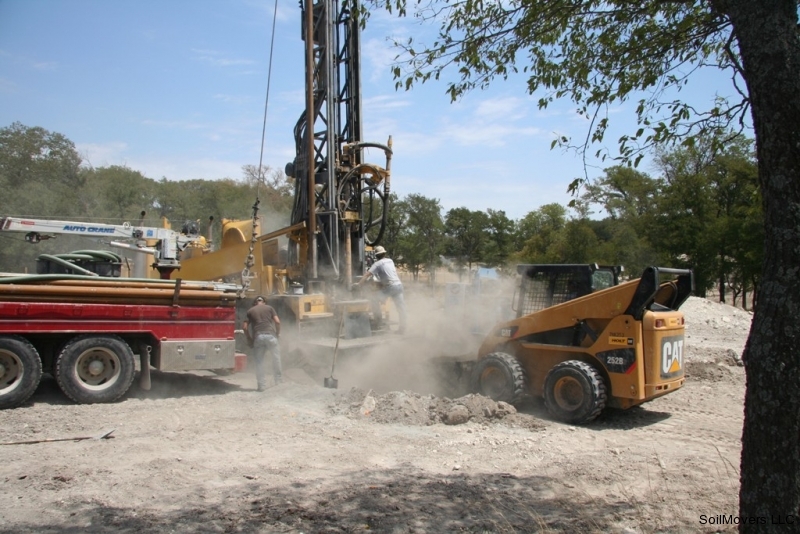 Most of the drilling was through solid rock and took a week to complete. 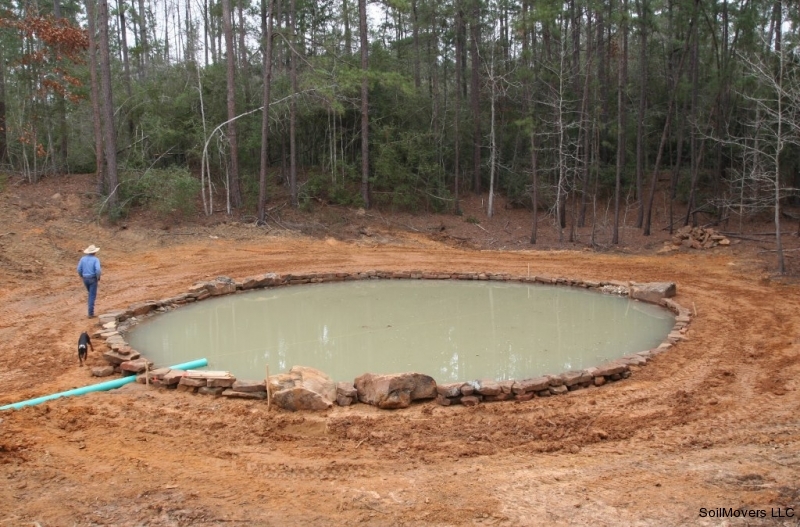 The well will be used to keep the lakes full. 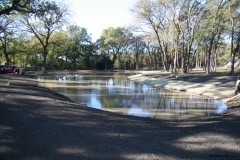 Since the lakes are connected, filling Lake 1 from the well will also keep the other lakes full. 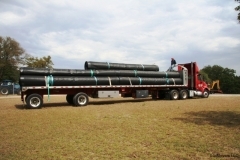 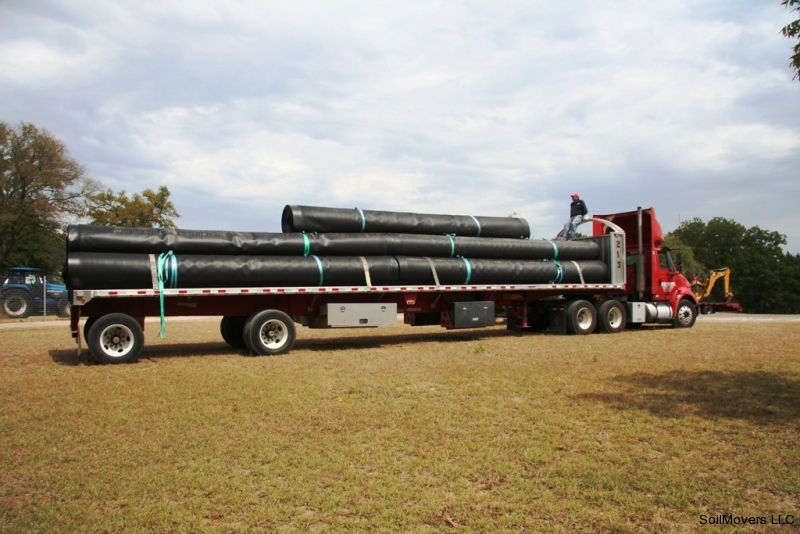 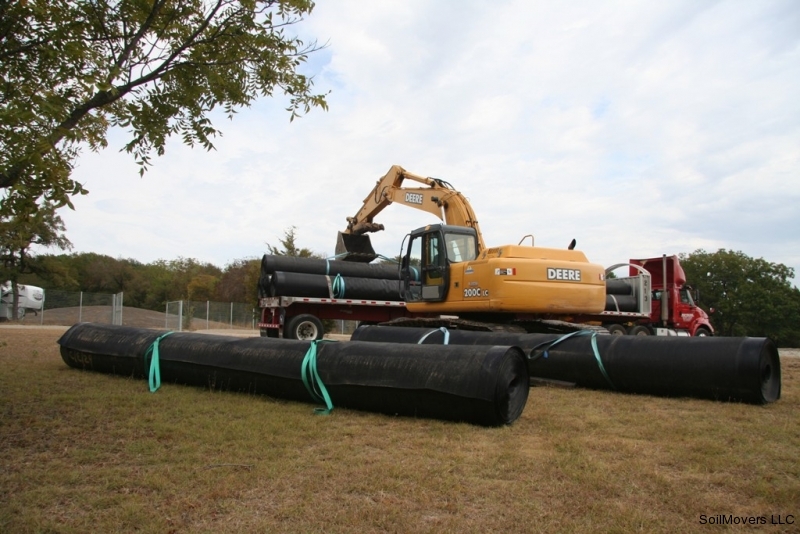 The plastic liner material arrives for the lake. Plastic liner material is 60 mil to withstand the rocky environment. The rolls of lake liner plastic are staged in a convenient area. 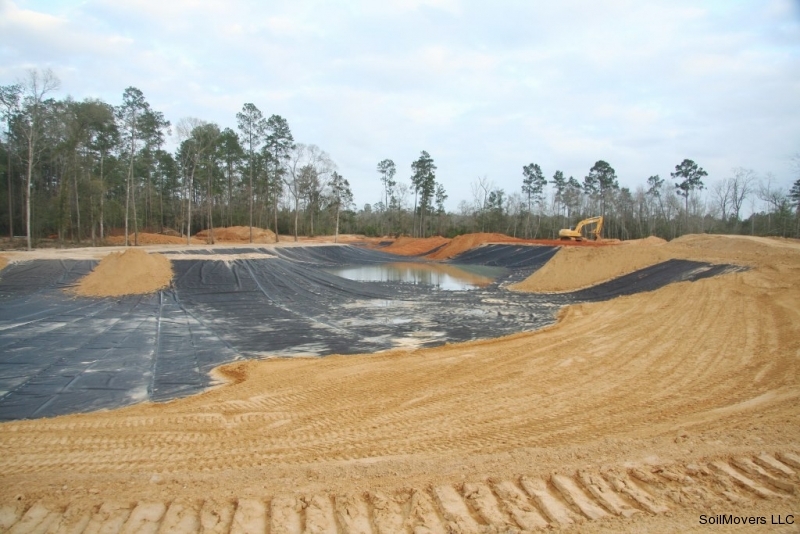 An anchor trench for the plastic lake liner is dug just above the waterline around the circumference of the lake. 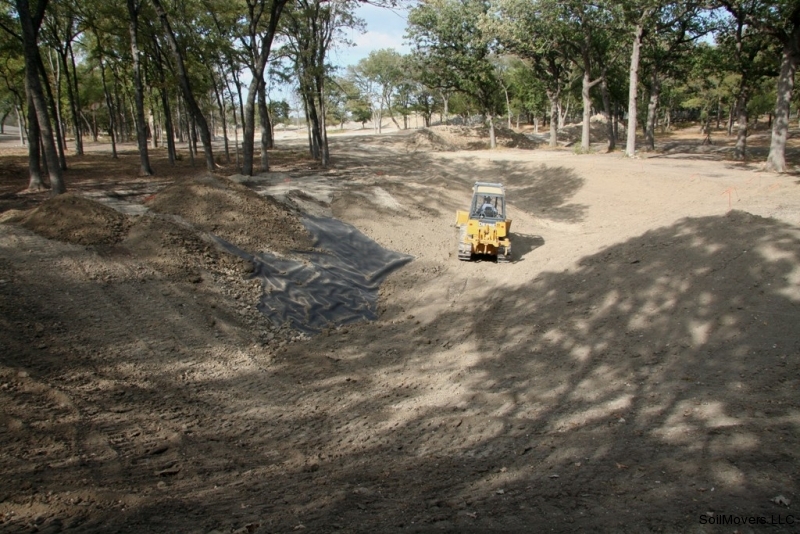 Anchor trench completed. 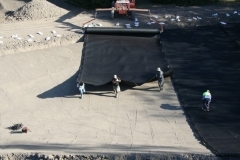 The components of the liner will be tucked into the trench and covered with dirt to permanently anchor the plastic liner. 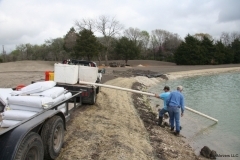 Sand bags placed around the edge of the lake. 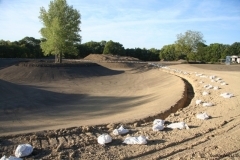 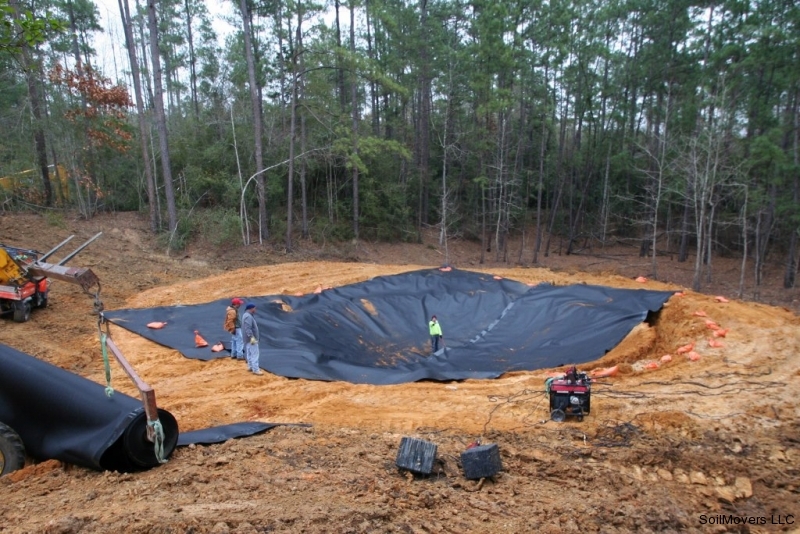 The sand bags are used to hold the liner down in the lake bed as it is installed and removed after liner installation is complete. 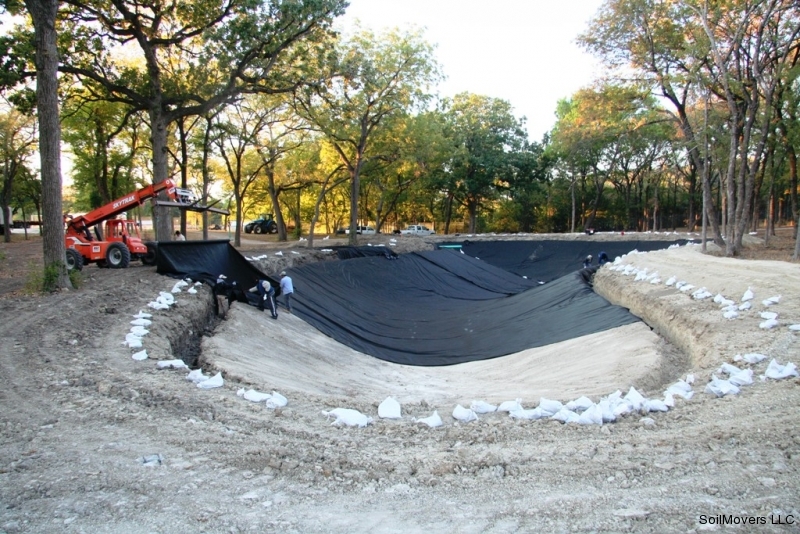 Ready for the plastic lake liner. 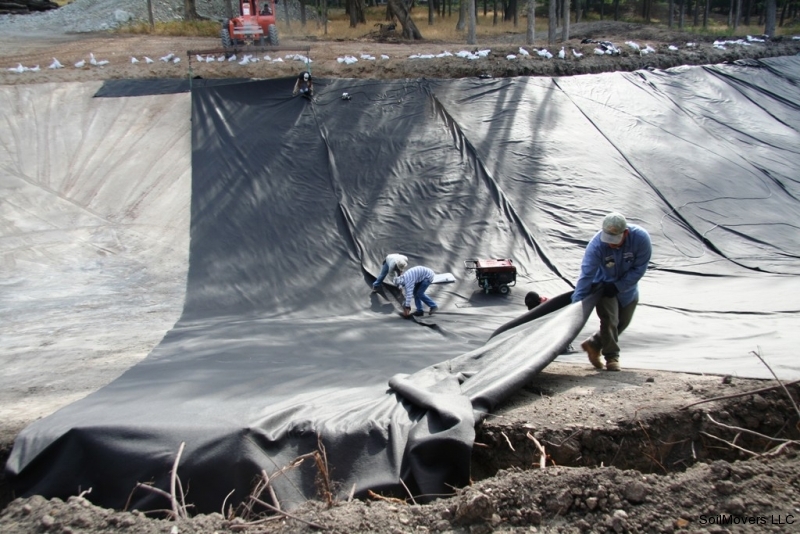 The geo textile fabric liner is the first layer and protects the plastic liner from rock punctures. 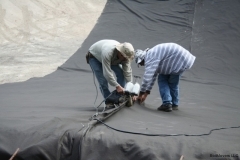 The fabric liner must be sewn together. Fabric liner installation nears completion on Lake 2. 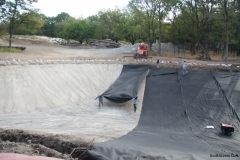 The liner is rolled out from the bank. 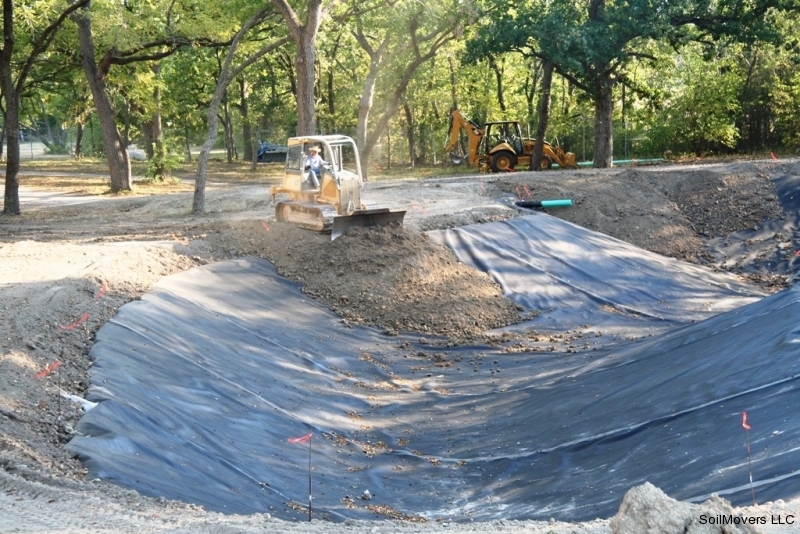 Installation of plastic liner nears completion on lake 1. 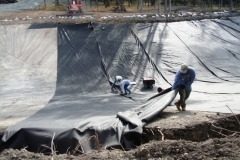 Lake 2 plastic liner installation. After the fabric liner and plastic liner are installed, cover dirt is carefully added. 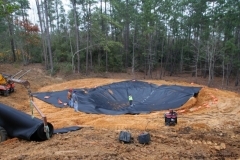 This will permanently anchor the liner and protect it. 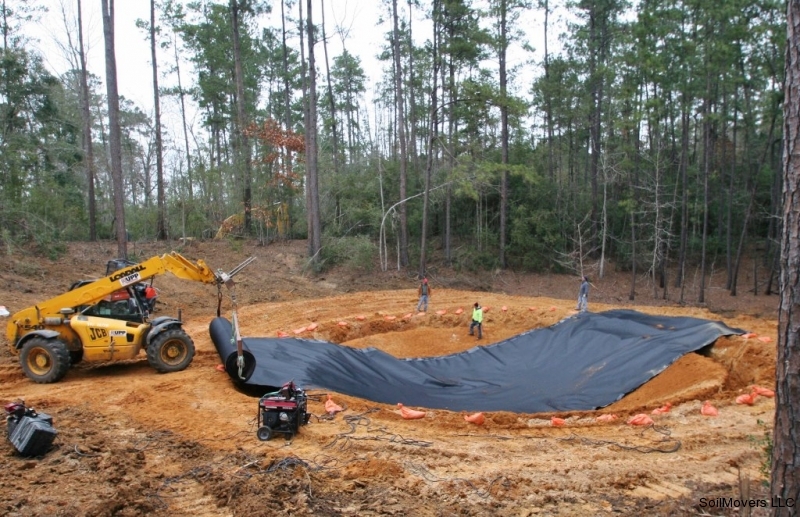 Layer of cover dirt almost complete. 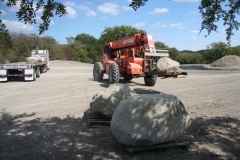 Large rocks are delivered from Colorado. 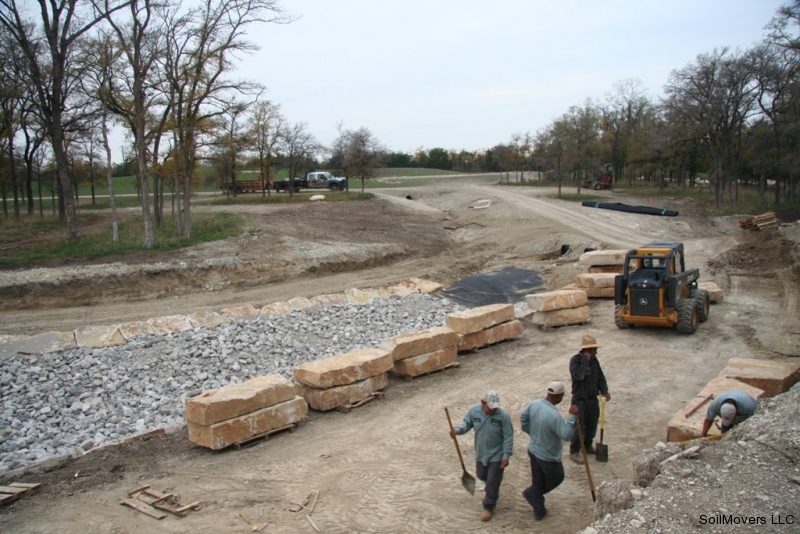 The decorative rock will highlight the many features that will include rock waterfalls, walls and waterways. 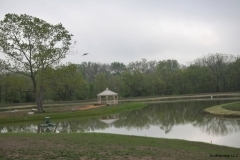 Walkways, firepit and a gazebo will be constructed at Lake 3. 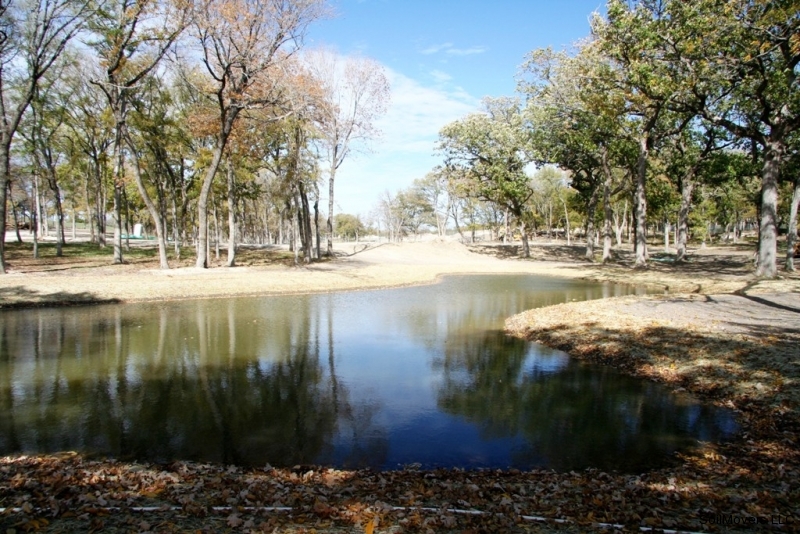 A custom made bridge will connect the island to the shore. 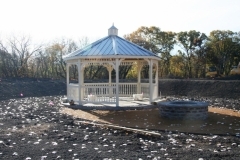 Lakeside gazebo and fire pit on Lake 3. 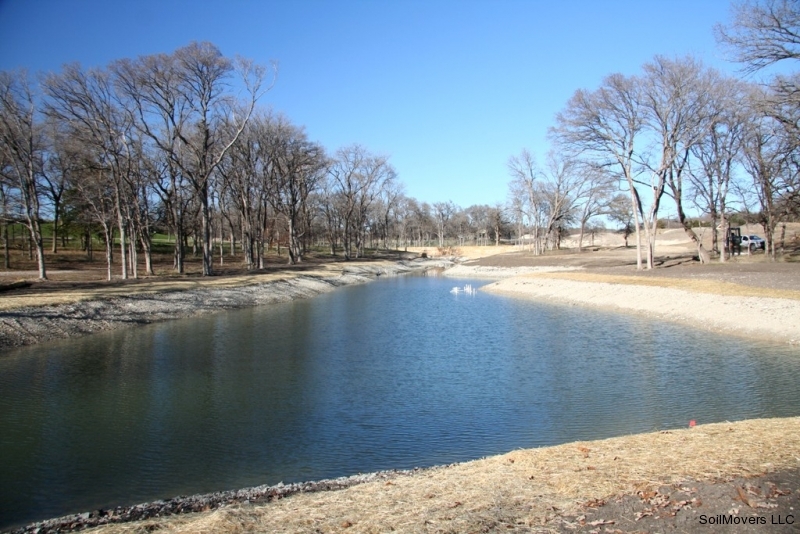 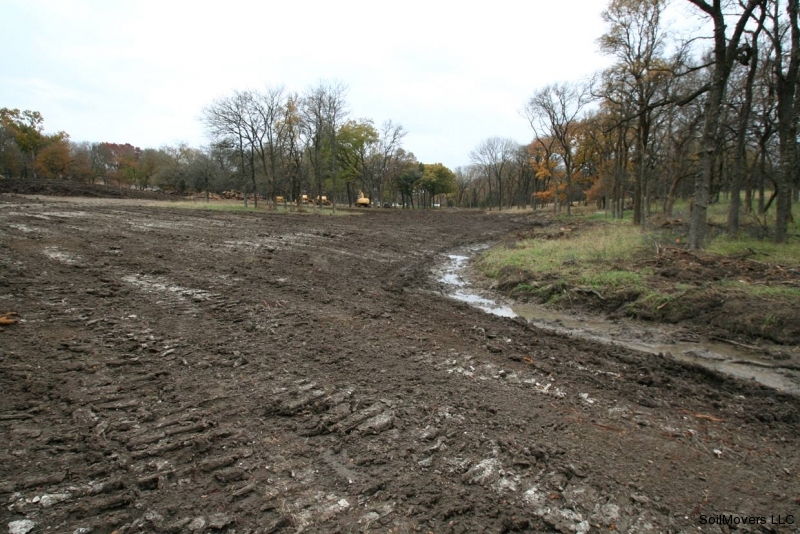 When the project was in its' initial stages, there was no Lake 3. Gives you an idea of how the project evolves over time with a good contractor. 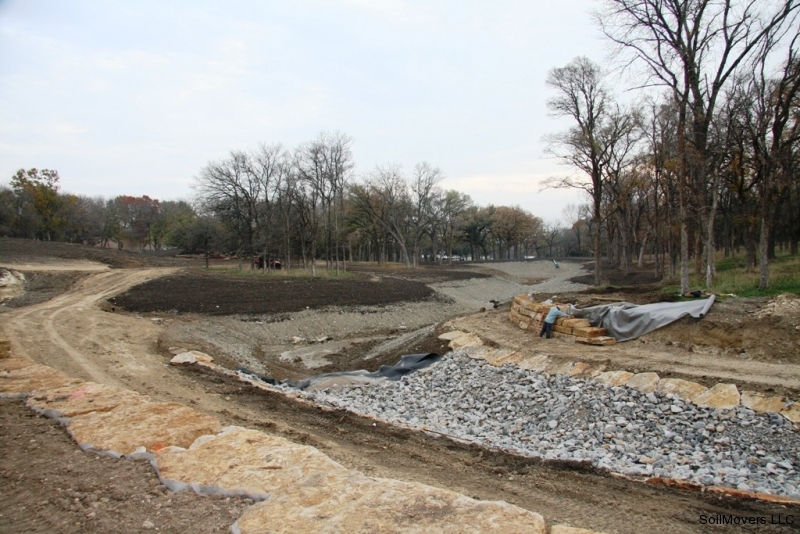 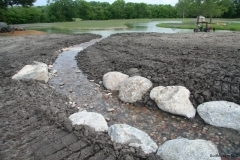 Lake 1 will have rock areas with rip rap at the head of the lake,, water falls and rock retaining walls. 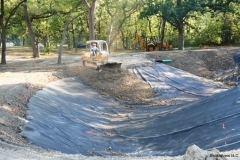 Lake 1 rip rap and construction of retaining wall. 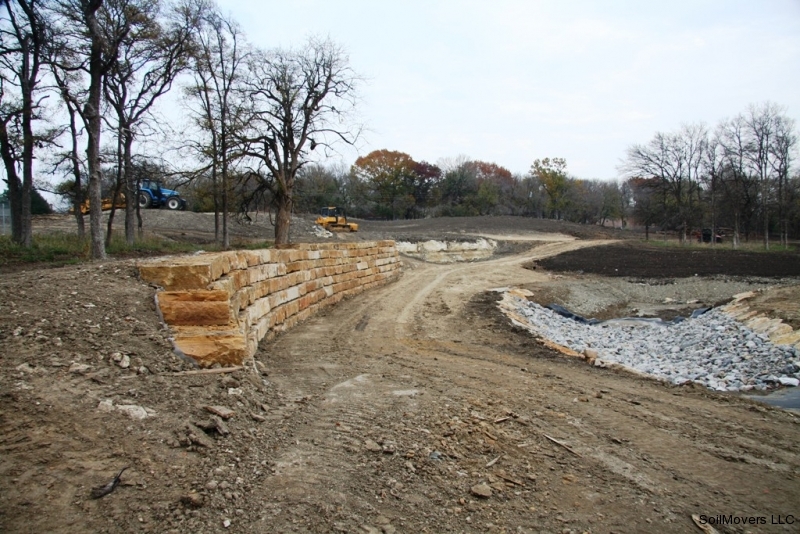 Retaining walls and rip rap placed on Lake 1. 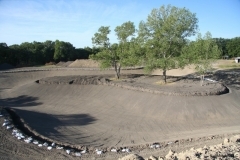 Topsoil in place on Lake 1. 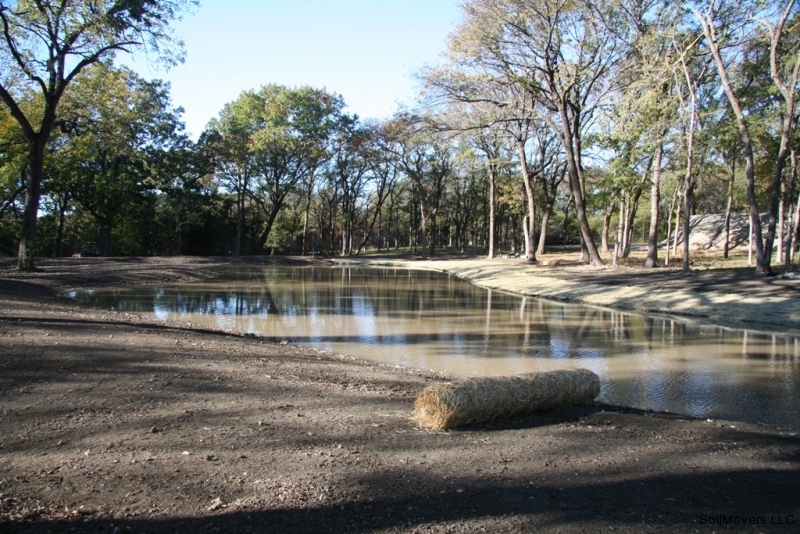 Lake 2 seeded with winter rye grass. 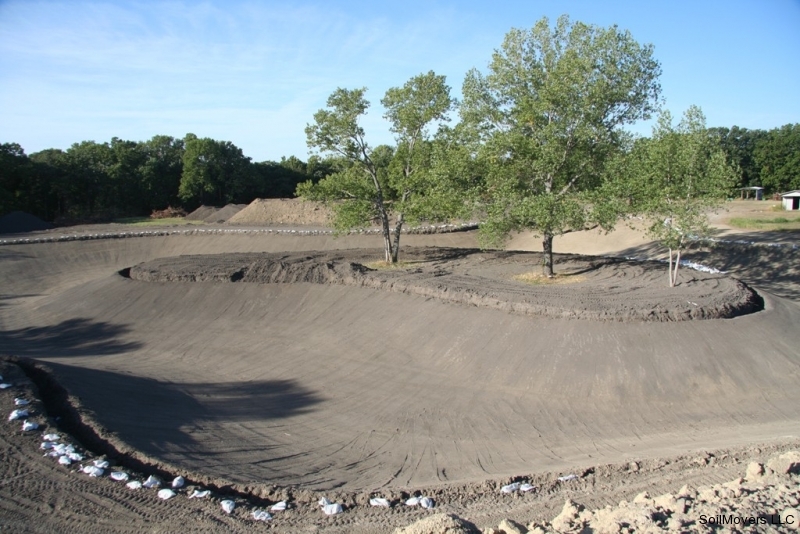 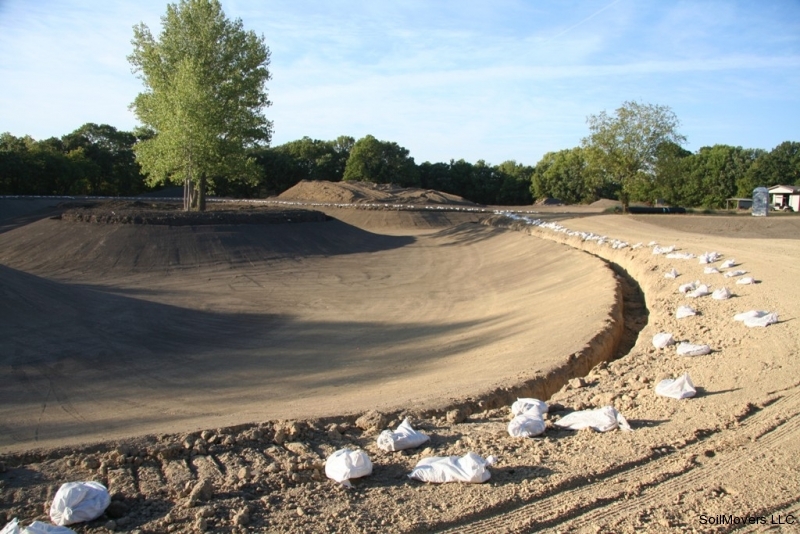 Lake 2 seeded with straw blanket for erosion control. 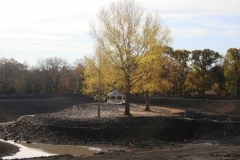 Lake 2 winter grass growing. 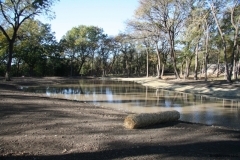 Water clarity improves considerably after only 2 weeks. 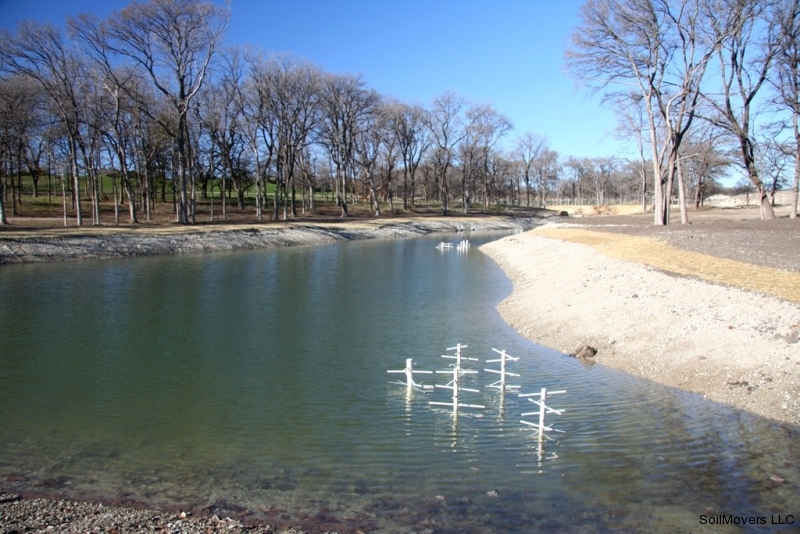 Fish structure in place on lake bed of Lake 1. 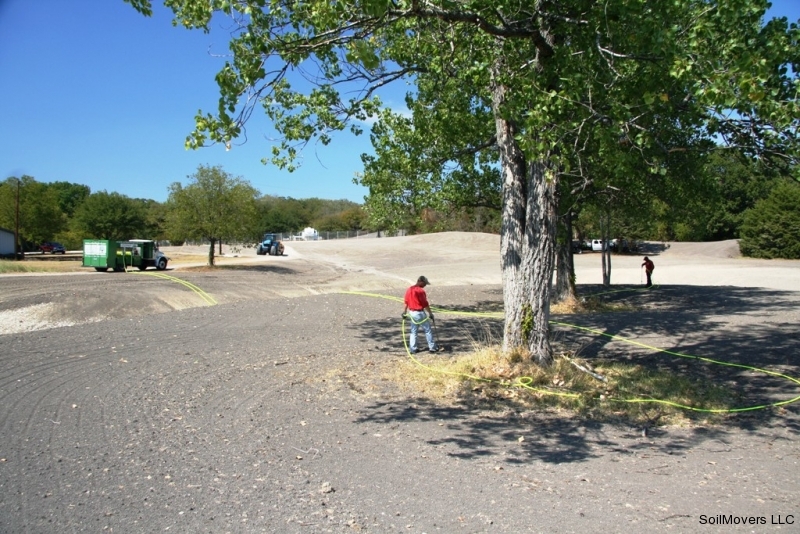 Before and after comparisons. 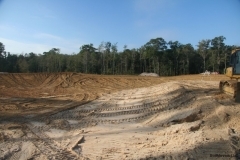 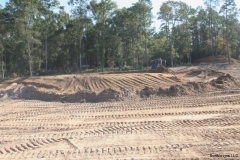 Lake 1 - early stages of excavation. 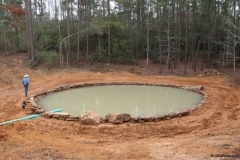 Lake 1- ready for water. 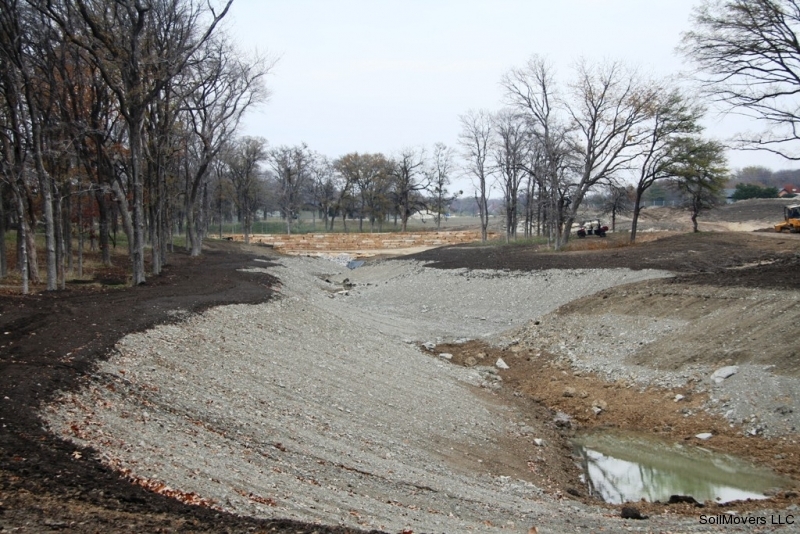 Lake 2 - Nearly full and winter grass coming up. 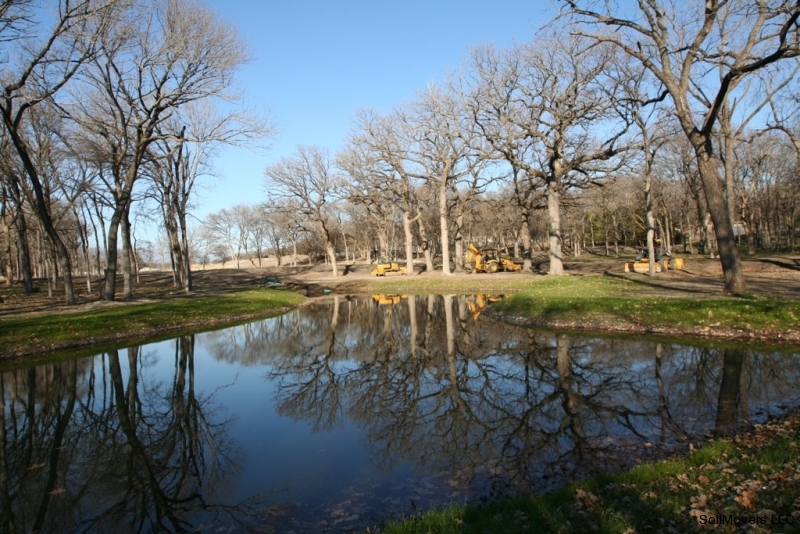 Lake 3 - prior to island excavation and separation. Lake 3 - area around island excavated. 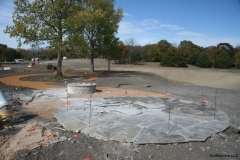 Lake 3 - Gazebo and firepit construction on island. 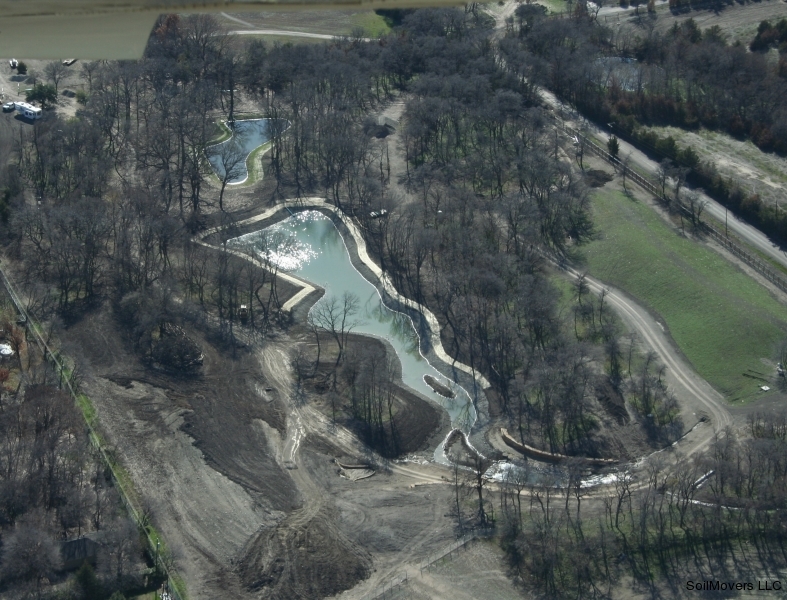 Aerial view - Lake 1 in foreground. 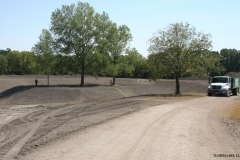 Erosion control until grass can be established. 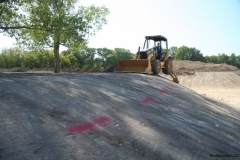 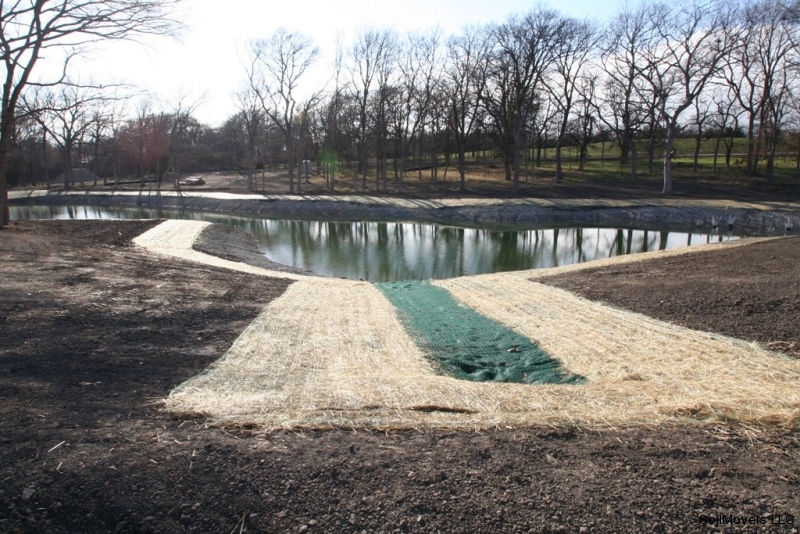 Erosion control in place around the lake. 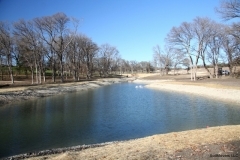 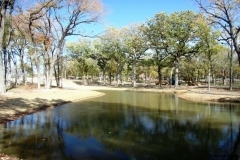 Lake is stocked with fish in early spring. 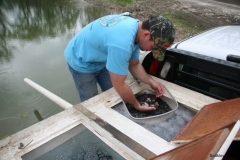 Minnows are stocked as well as larger fish. 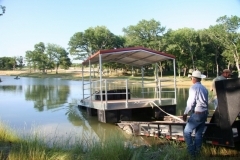 Solar fish feeder in place, fish are fed twice daily. Spring grass turns the banks green. 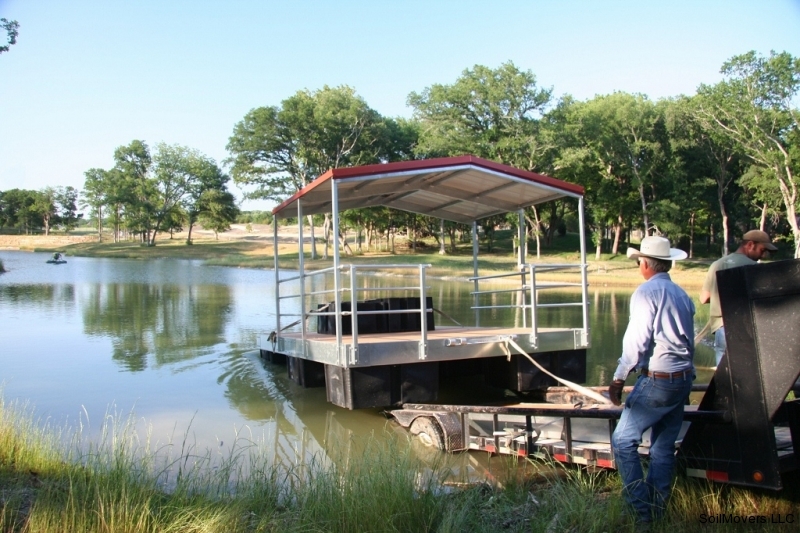 Floating dock temporarily attached to bank. 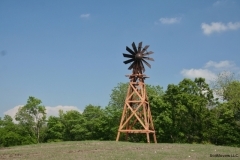 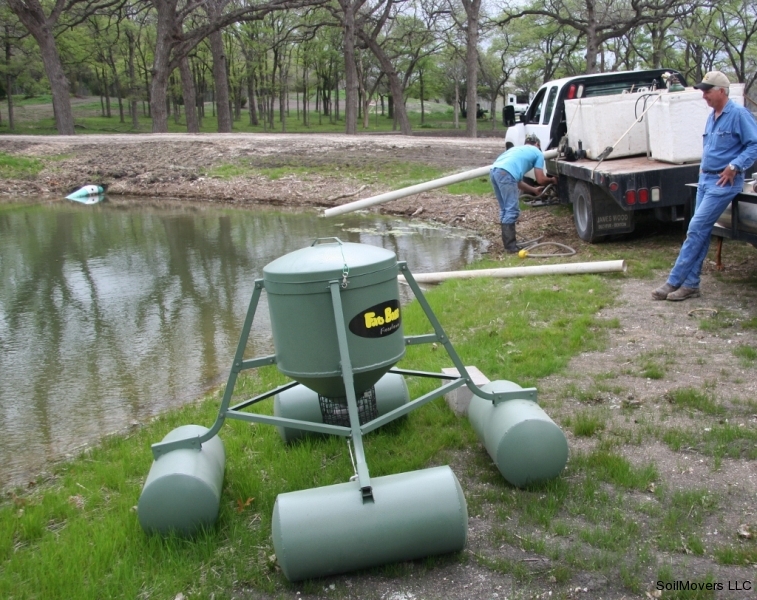 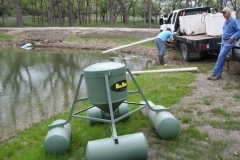 Windmill is used to power fish aerator pumps. Plastic liner for man made creek which feeds Lake 3. 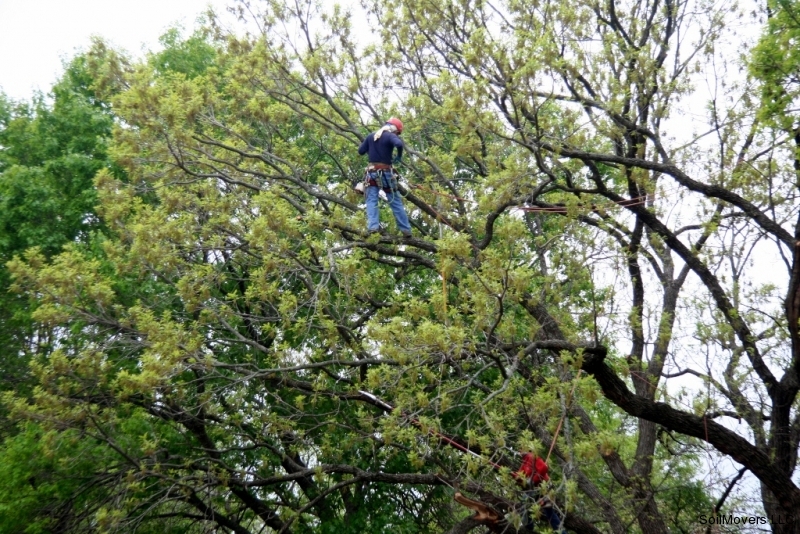 Professional tree trimmers at work on lakeside trees.